Collabware is proud to be an exhibitor for SharePoint Fest Chicago from December 5-8, 2017 at McCormick Place. Please register and come join us, along with hundreds of SharePoint and business professionals for four days of learning, workshops, and great discussions! Collabware is the expert in obtaining compliant records management using SharePoint. 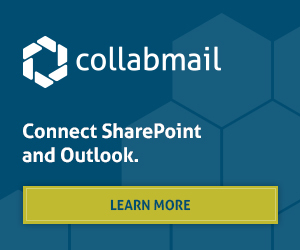 Come by the Collabware booth in the exhibit hall and see a demonstration on how Collabware products enhance SharePoint to help you increase employee productivity and ensure organizational compliance requirements are met through automated case management, workflow, and records management. Click here to register for SharePoint Fest DC Tickets and take advantage of our promo code "CollabwarDC15" for a 15% discount!